The Walther Creed pistol was introduced in late 2016, and was designed to target the CCW and home defense market as a sub-$400 polymer pistol that performed well and had a number of popular features. The Creed is predominately based on the Walther PPX, which was also a very good value, but lacked some popular features. Walther took the feedback on the PPX and integrated into the Creed. The end result is a retooled PPX with the look and feel of the more popular Walther PPQ series. (1) The pre-cocked trigger is less expensive to produce and install compared to a striker fired model, which keeps the costs down. (2) The pre-cocked approach gets new shooters to focus on staging the trigger versus slapping it. The Creed comes standard with an ambi magazine release, and two 16 round magazines. Magazines from the PPX will also fit in the Creed. The pistol is equipped with basic 3 dot non-night sights that are to be expected on a pistol in this price range. The Creed features a Tenifer finish (like Glock) along with front and rear cocking serrations. 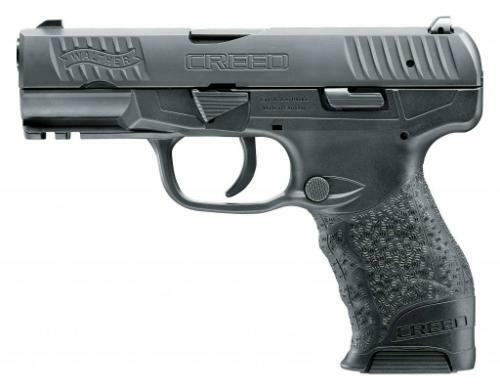 Unlike the higher priced Walther models, the Creed does not have palm swell panels or adjustable grip straps. The grip and palm swell are fixed. #1 – I’m having a time finding a nice leather holster to fit the Creed since it’s fairly new. Do you offer any holsters that will fit it? Yes. Any holster listed below is available in a version to fit the Walther Creed. #2 - Since the Creed is similar to the PPX; will it fit in a holster made for the Walther PPX? Unfortunately, it won’t. Although similar to the PPX in style and design, the Creed has very different dimensions. #3 – Will a Creed fit a holster made for a Walther PPQ? No it won’t as the PPQ has different dimensions as well. #4 – I just got a new Walther Creed and I have a Streamlight TL3 mounted on it. Do you have a holster to fit that? We can probably help as MTR offers a number of Walther Creed holster models made to fit the Creed with a number of various, popular lights mounted. #5 – Can you recommend a good OWB holster for the Walther Creed? Any of the OWB holsters listed below would be a possible option for you. Our most popular OWB holster sellers for the Creed are the MTR Custom Slim-Line Deluxe Full-size Pancake holster and the MTR Custom Deluxe Full-Size Quicksnap Holster (both can be seen below). #6 – I’m a big fan of Don Hume holsters, but don’t see any below for the Creed? Why is that? As it stands right now, Don Hume is not yet offering a Walther Creed holster model. #7 – I have the 10 round version of the Creed designed for states with a magazine capacity limit. Do you offer any holsters to fit that model of the Creed? The 10 round version and the 16 round version of the Creed are the exact same size so they fit in the same holster. The only difference between the two is the magazine capacity, which really has no bearing on holster fit. #8 - Do you carry a good Walther Creed IWB holster? Any of the IWB holster models shown below (such as the MTR Custom Adversary, Slim-line Tuckable, or Adversary Tuckable) are all good IWB options for the Creed. Any holster model you see listed below is available in a Walther Creed holster version.